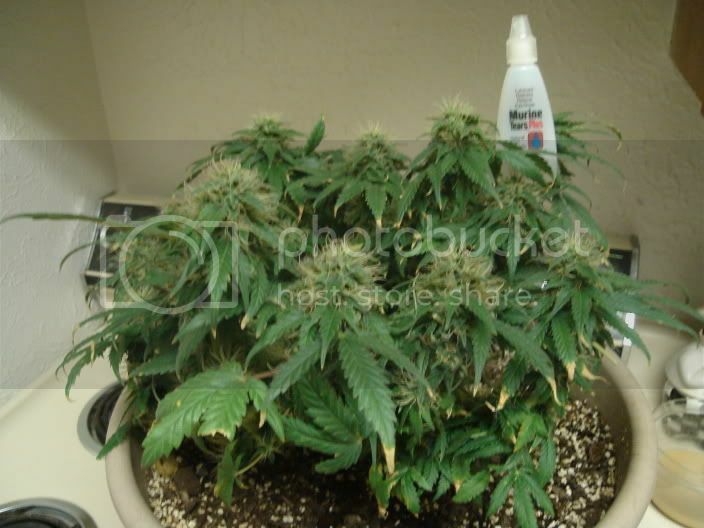 Discussion in 'Growing Marijuana Indoors' started by ChronikTokR, Apr 17, 2006.
here are my tweo ladies 6 or 7 weeks. they done? for some reason plant 1 got a little polinated and plant two didnt. so what you guys think? chopem this weekend. i realy just wanna get these ak47 and NL in there they are the real money makers. Dude your plants look like they need about another few weeks or so. There's barely any trichs on the leaves, there are a lot of white pistils, and the buds are still pretty small. If you want quality marijuana you're going to have to wait a little longer than you estimated. Also what are you feeding them, they look over fertilized? I'd give them a litle longer. Looks like there is still a lot of life in her, and that time could be put to fuller denser, and more trichome covered buds. "my two ladies 6 or 7 weeks" this is only half of all growing time... they are kids, u can't kill them yet! i know i know. you cant tell how much your gettung utill its dry but any ideas on what i might be able to yield? no idea. your second plant is prettyy big. they are looking a bit too yellow though. but yeah you should let those buds get nice and fat and overtake all those hairs. hehe. really. i thought they looked kinda small. i was told i might get and ounce total from both plants. but i dunno. there reallly busy. what can i do to help plant number 2? I say you'll yield better then what your friend thought.. I say you have another 2-3 weeks to go.. Count all those shoots you got there.. Those main buds have to at least be 2 grammers when done.. Add it up, and it close to an ounce a plant.. I'd say you'll at least get a half from plant 1, and an ounce from 2.. Just a guestamate really.. Hard to tell without squeezing them a bit to see how dense they are.. you still have time though they'll fatten up quite a bit at the end. well one of the top colas on plant 1 borke and it was an 8th dried. and they are all about that size. and for ferts i use 15-30-15 every other week. and i givem a gallon of distilled water every week. how much bigger with they get? well, your plants probably won't get any bigger, but the buds still have quite a bit of room to fatten up. (2) break off a little piece, dry it for 24 hours, and smoke her up. If you like the high chop her down. It looks like you have a little longer to grow though. I estimate an ounce for both plants maybe a tad bit more. Good luck and enjoy. Think they are almost done? First timer: Are they done?